Reading the Fantastic Four comics from the start. In issues #355-356, longtime Marvel editor Tom DeFalco takes over writing duties, and he’s here to push the reset button in a big way. In issue #355, Ben goes back to his childhood neighborhood on Yancy Street, reuniting with his old neighbors, after which he gets into a fight with the Wrecker and a depowered Thunderball, both of the Wrecking Crew. What’s interesting here is that a footnote states that this takes place before Thor #418. But wait, that was 1987 — five years earlier! That means this issue likely takes place around Fantastic Four issues #300-303. Was this issue written with that intent, or was it created years ago, and pulled out from storage now to meet deadline? We may never know. DeFalco’s run truly begins in issue #356. 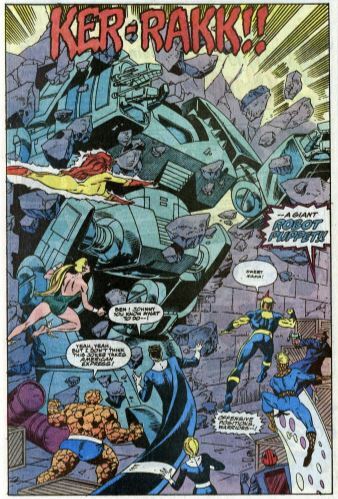 Despite (or perhaps because of) the Image Comics revolution happening all around him, DeFalco mission statement for Fantastic Four was to go back the 1960s, clearing the table of all the changes made by Byrne, Englehart, and Simonson, and restore the FF to their original, classic status. As such, the issue begins like so many of the Lee/Lirby issues, with Ben and Johnny bickering in headquarters, and Reed and Sue breaking up their fight. It’s the old excuse-for-the-characters-to-show-off-their-powers-for-a-few-pages thing. As Ben walks off to sulk, Reed explains to the others that Ben is merely upset because he’s now a monster again, after being human for a while. And in one short sentence, Reed adds that Sharon has “deserted” him. With that throwaway explanation, Sharon is off the team after we’ve spent more than 50 issues with her. 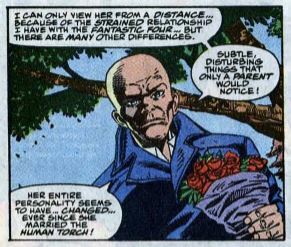 Cut to the Puppet Master, who is standing by his wife’s grave, speechifying about how he can tell something is wrong with Alicia, and how her personality has seemingly changed since she married the Human Torch. He says these are things that only a parent can notice. He swears to solve the mystery. 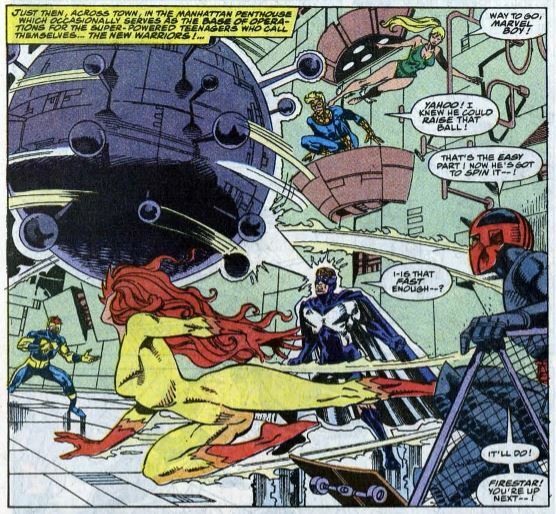 Then this ‘60s-style comic takes a left turn into the ‘90s, as we visit the New Warriors, who were Marvel’s hot property of the moment. But is the ‘60s throwback version of them. They’re in their version of the X-Men’s Danger Room, getting their own excuse-for-the-characters-to-show-off-their-powers-for-a-few-pages thing. The New Warriors consist of Firestar, Nova, Marvel Boy, Namorita, Speedball, and the super-skateboarding Night Thrasher. Marvel Boy gets a telepathic flash warning him of danger. While the others remind him that he’s not telepathic, Marvel Boy flies off. The rest of the team follows him. We then catch up Johnny and Alicia (who is secretly Lyja the Skrull in disguise) where they discuss her making abstract sculptures rather than the realistic ones she used to make. Marvel Boy comes flying in through the window and abducts Alicia. (The reader knows Marvel Boy is being controlled by Puppet Master because his earlier scene showed him creating a Marvel Boy puppet.) Johnny pursues Marvel Boy, but can’t attack for fear of harming Alicia. The New Warriors see Johnny chasing Marvel Boy, so they attack Johnny. He signals the rest of the FF, who are quick to show up in a Fantasticar. Everybody fights! Firestar is no match for Johnny, but Namorita manages to punch him in the face. Nova smacks right into Sue’s force field. 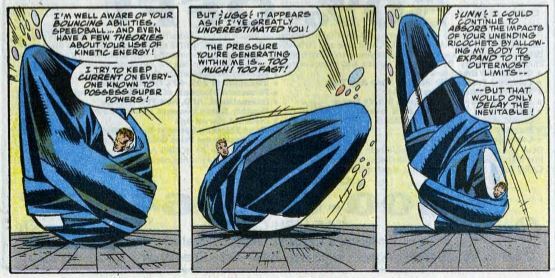 Reed tries to stretch himself around Speedball, but he can’t contain Speedball’s non-stop bouncing kinetic energy. Speedball escapes Reed, and that same kinetic energy sends Ben flying through the air. Unstable molecule: Reed knows about how Speedball’s powers work because, he says, he makes it a point to study up all new superheroes’ powers. Is that creepy? I’m thinking it’s creepy. Fade out: When Sue has Night Thrasher trapped in a force field, he says he has weapons that can break through it, but we never see what those weapons are. Clobberin’ time: Ben is upset at the beginning because someone crushed a statue of himself. Reed later deduces that Ben was so down in the dumps that he smashed it himself. Flame on: Johnny demonstrates a new power while fighting with Ben. He breathes hot steam into Ben’s face. Fantastic fifth wheel: After all that drama about Sharon’s PTSD and then her romance with Ben, it’s a huge disappointment to have her written out of the team so dismissively. 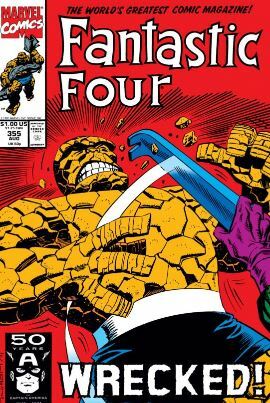 The last time the FF was just the original four members was in issues #301-302. The last time before that was way back in issue #264. 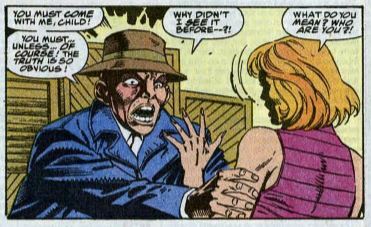 The Alicia problem: The Alicia/Lyja thing was Tom DeFalco’s idea, so this issue is the first official foreshadowing, and the hints that Alicia is not really Alicia are all over this issue. What’s odd, though, is that Lyja doesn’t recognize Puppet Master, even though she’s been immersed in Alicia’s life all this time. Maybe she was just caught off guard. 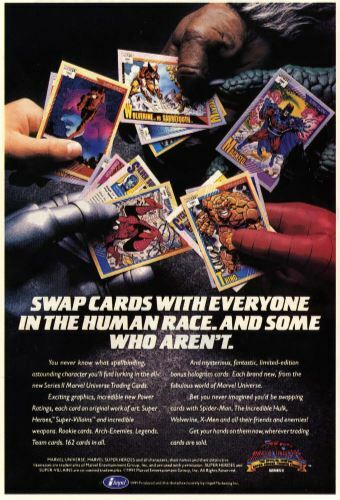 Commercial break: Okay, there’s a human, Dr. Doom, Spider-Man, the Lizard… whose hand it that supposed to be on the top right? 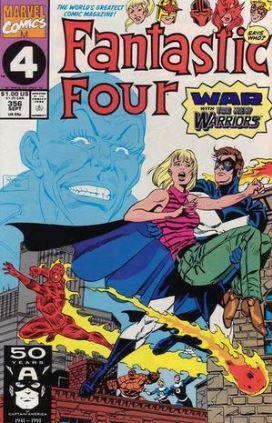 Trivia time: Although the FF and the New Warriors act like they’ve never met before, the crossed paths during the Atlantis Attacks and Acts of Vengeance crossovers. Not a lot of time for socializing during crossovers, I guess. The New Warriors’ headquarters was located inside Night Thrasher’s huge Manhattan penthouse. Skateboarding might be Night Thrasher’s gimmick, but with the way he’s written, he’s basically Batman. The New Warriors’ version of Marvel Boy is Vance Astrovik, son of Vance Astro of the original Guardians of the Galaxy. His powers are often described as “psychic,” which looks to me like basic telekinesis. Like Ben and Sharon, he too was once involved with the ridiculous Unlimited Class Wrestling Federation. Fantastic or frightful? Although I feel that the “back-to-basics” approach isn’t what’s needed for the Fantastic Four at this time, this issue isn’t so bad. The fact that the New Warriors are able to hold their own against the FF in the fight makes it all worth it. Next: I married a what now?